4920 14.1B Gemania stamp booklet 1921, serial number 1, stamp booklet panes no perforations going through margins, unfolded, in perfect condition mint never hinged Michel 370,- €. 4921 23. Jan Help in need stamp booklet 1926, fresh colors, unfolded, in perfect condition mint never hinged in perfect condition. Michel 1200,- €. 4923 28. 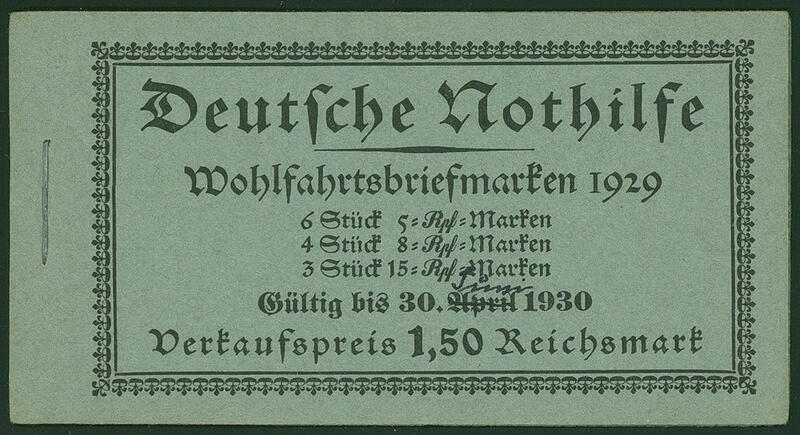 Jan Help in need stamp booklet 1929, unfolded and in perfect condition mint never hinged Michel 550,- €. 4924 28. 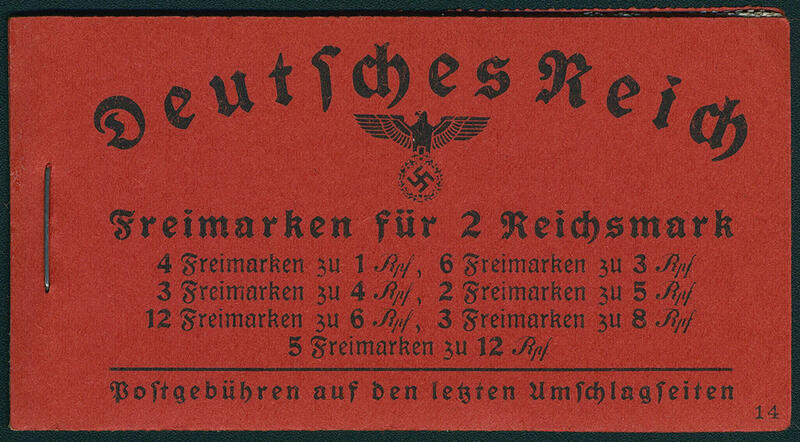 Feb Help in need stamp booklet 1929 with handwritten changed date of validity, rear cover side gum traces, otherwise in perfect condition mint never hinged Michel 1200,- €. 4925 28. Feb Help in need stamp booklet 1929, the scarce variety \"date of validity on the front booklet cover handwritten modified\", small faults, both stamp booklet panes in perfect condition mint never hinged Michel 1100,- €. 4926 28. 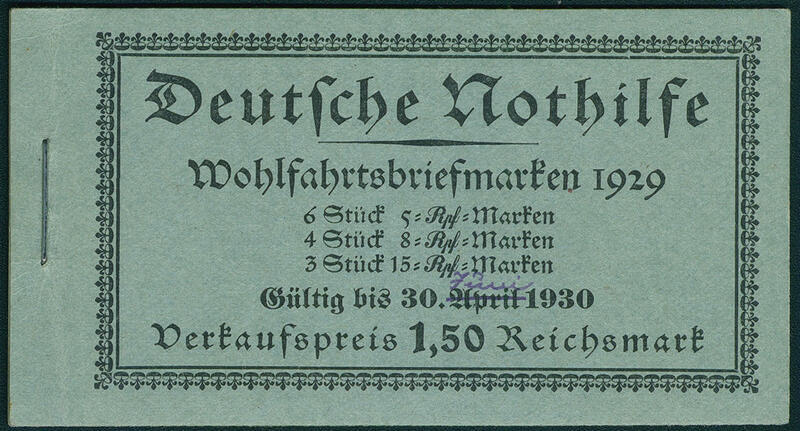 Mrz Help in need 1929, the very scarce stamp booklet with inscription \"valid until 30. 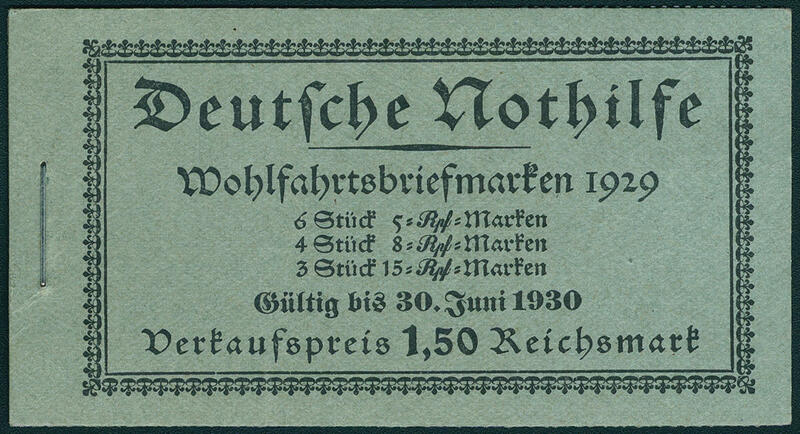 June 1930\", fresh colors, unfolded, in perfect condition mint never hinged with the three stamp booklet panes in utterly perfect condition. 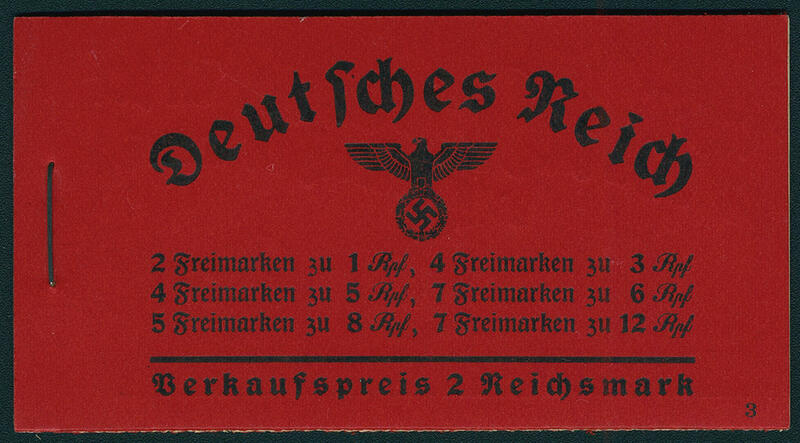 An outstanding quality this large stamp booklet rarity, from the very few examples have become known. A Honor for the sophisticated special collection! New photo expertize \"the quality is perfect\" Hans-Dieter Schlegel BPP. 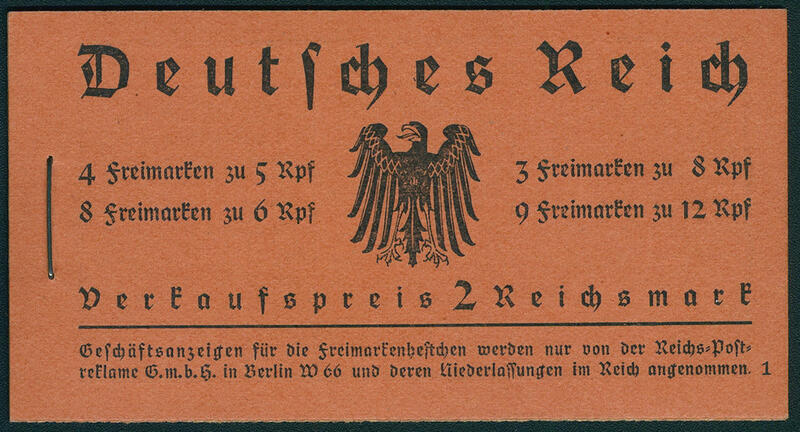 4927 32.3 Friedrich the large stamp booklet 1933, stamp booklet panes perforations going through margins respectively no perforations going through margins, in perfect condition mint never hinged Michel 250,- €. 4928 33 Hindenburg stamp booklet 1933, watermark waffle, wonderful fresh colors, unfolded and in perfect condition mint never hinged Michel 900,- €. 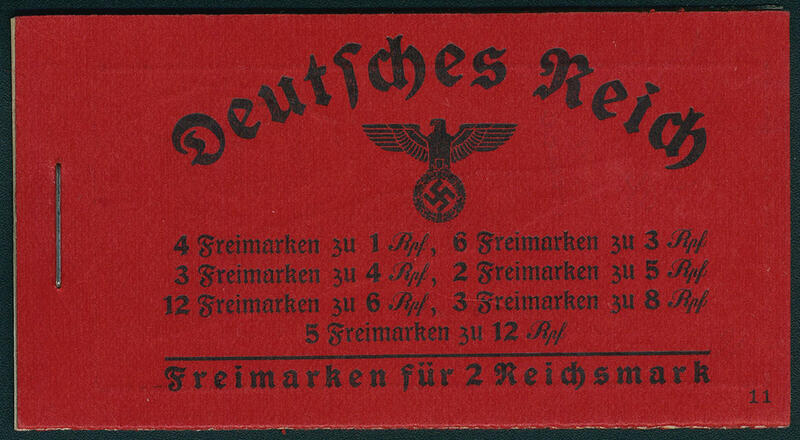 4929 35 Hindenburg stamp booklet 1934, unfolded, right above small inconspicuous numbering \"3 A\", possibly postal service official, as far as in perfect condition mint never hinged Michel 800,- €. 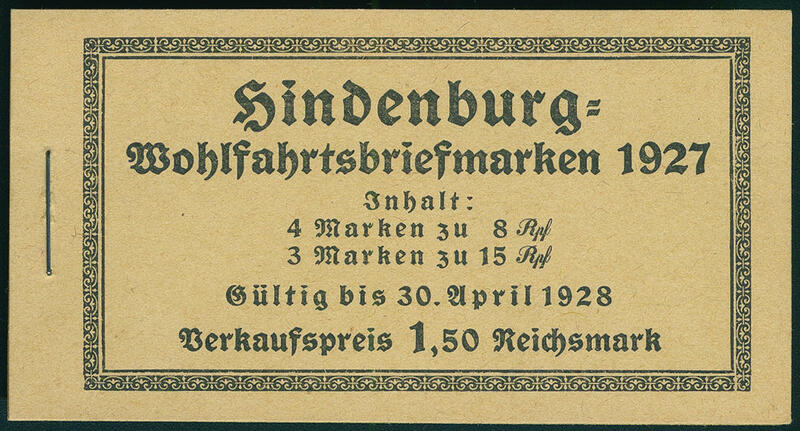 4930 36.2 Hindenburg stamp booklet 1936, serial number 3, advertisement \"no sunburn, DELIAL\", unfolded, wonderful fresh colors and in perfect condition mint never hinged Michel 450,- €. 4931 39.1 Hindenburg stamp booklet 1940, serial number 11, fresh colors and unfolded, in perfect condition mint never hinged Michel 240,- €. 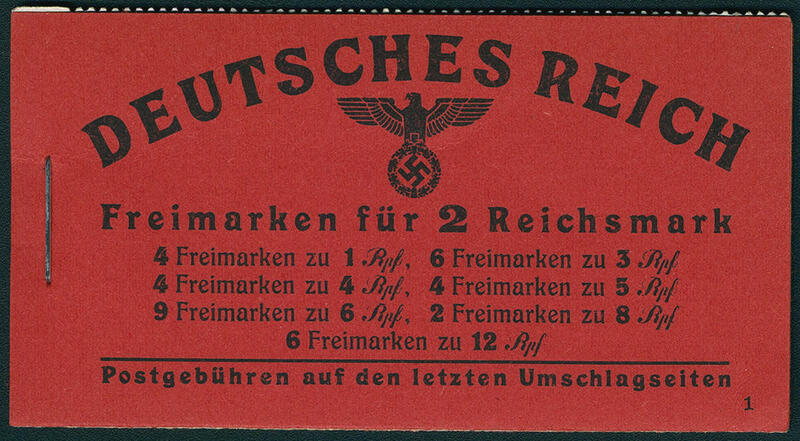 4932 39.4 Hindenburg stamp booklet 1941, serial number 14, unfolded, in perfect condition mint never hinged Michel 200,- €. 4933 40.4 Occupation state stamp booklet 1934, stamp booklet panes no perforations going through margins respectively perforations going through margins, fresh colors and unfolded, in perfect condition mint never hinged Michel 400,- €. 4934 48.1 1941, advertisement \"eraser\", fresh colors, unfolded and in perfect condition mint never hinged Michel 130,- €. 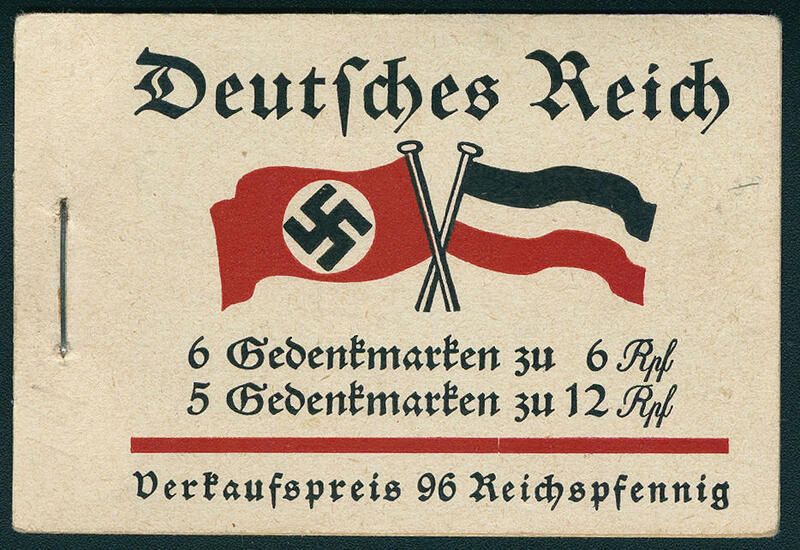 4935 48.2 Hitler stamp booklet 1941, advertisement \"pencil\", unfolded, in perfect condition mint never hinged Michel 160,- €. 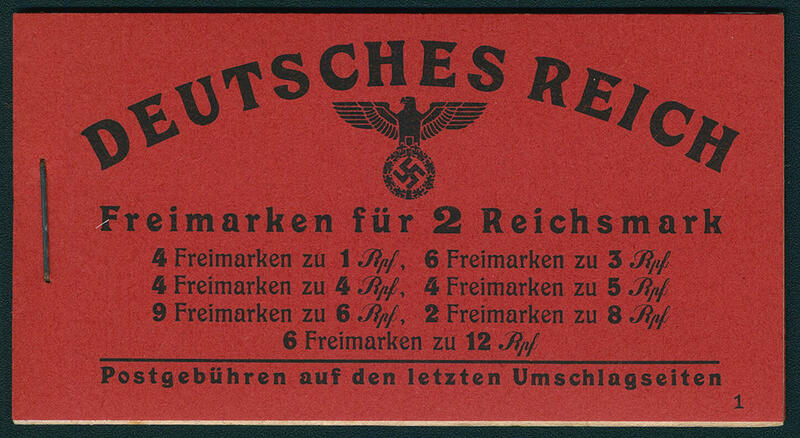 4936 49.1 Hitler stamp booklet 1941, advertisement \"eraser\", unfolded, in perfect condition mint never hinged Michel 200,- €. 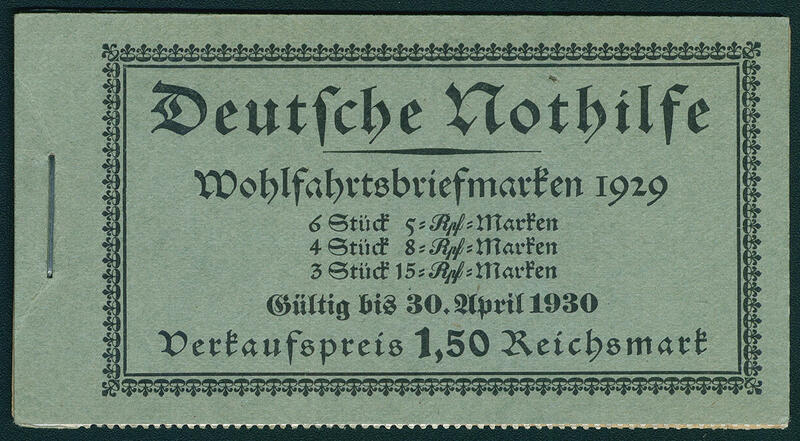 4937 49.3 Hitler stamp booklet 1941, scarce advertisement \"indelible pencil\", fresh colors, unfolded and in perfect condition mint never hinged Michel 500,- €. 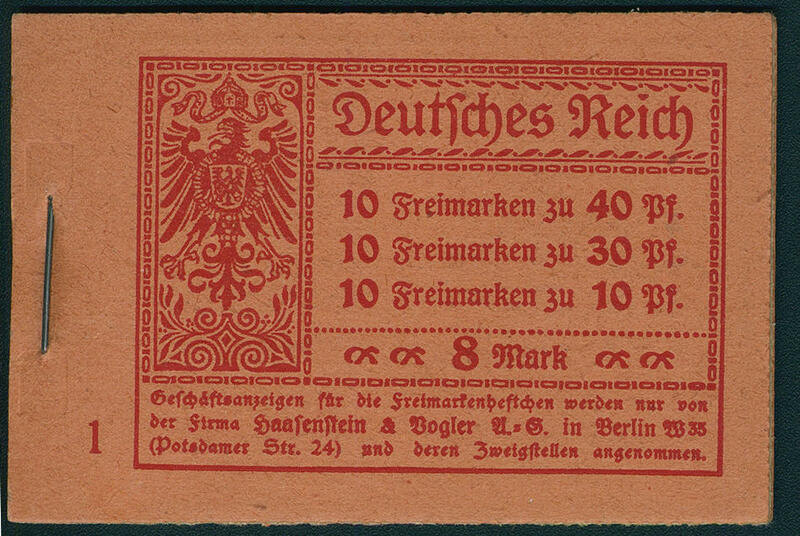 5003 ✉ 1Ba Airmail Bork Brück 1912, unperforated proof on chalky paper, fresh colors and large margins all around with 10 Pfg. 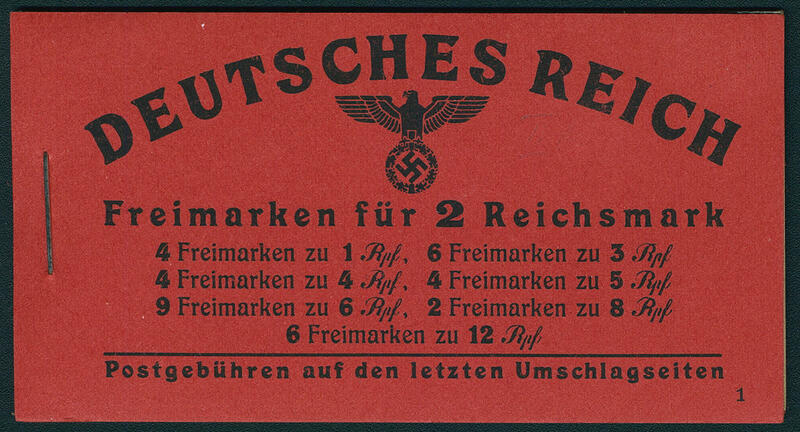 Germania, these with security punch \"G. R. \" (Georg Rothgiesser) with clear first day cancel \"BRÜCK 26.2.12. 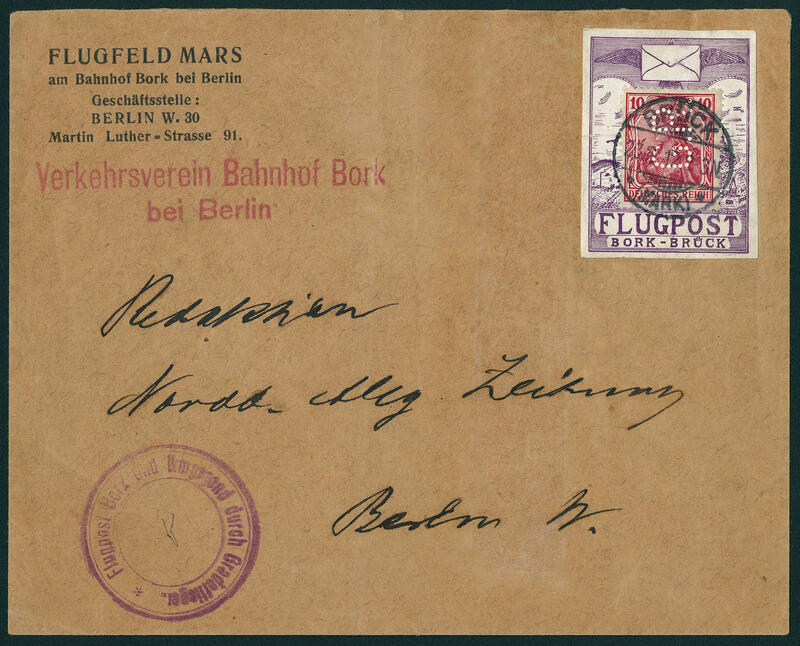 \" to Berlin, slight traces of usage in the cover are perfect insignificant. Additional clear violet three-ring cancel \"airmail BORK and environments through Grade aircraft\". 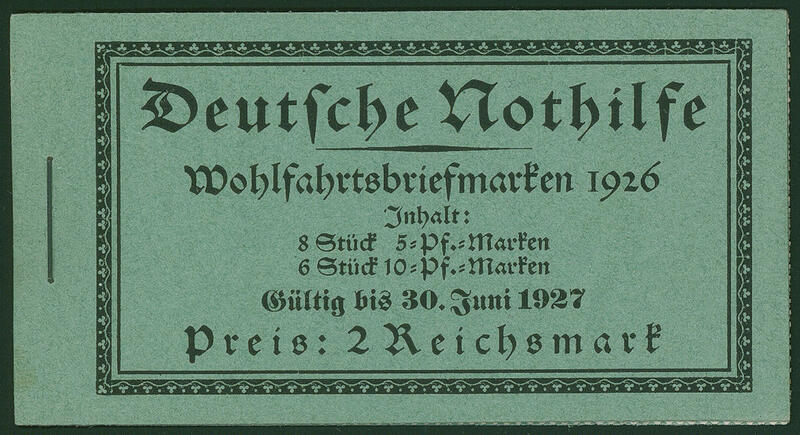 The edition of this proof amounted to be on only 90 examples. It is only another cover have become known, whereby however the proof repaired is. 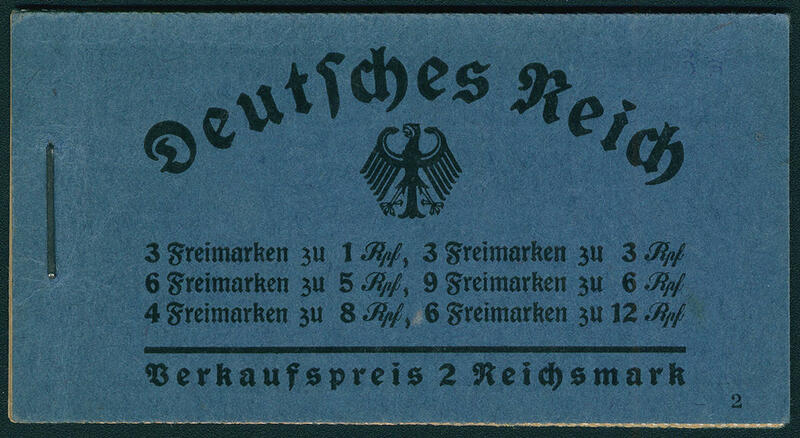 This is a largest and most spectacular Airmail-rarity of the German Reich! Photo expertize Mary Brettl. 5004 5 10 Pfg. 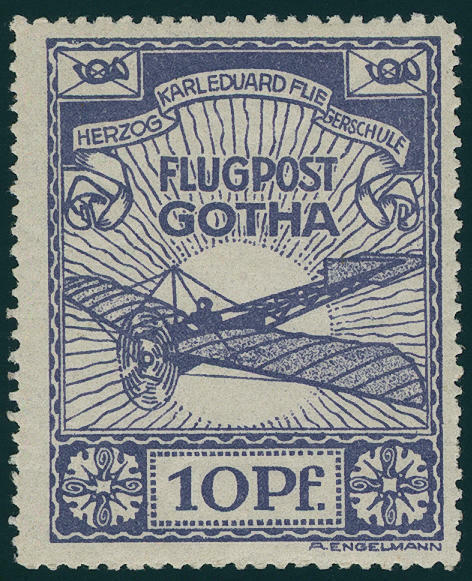 Airmail Gotha 1912, fresh colors and very well perforated, in perfect condition mint never hinged in perfect condition, without any signs. 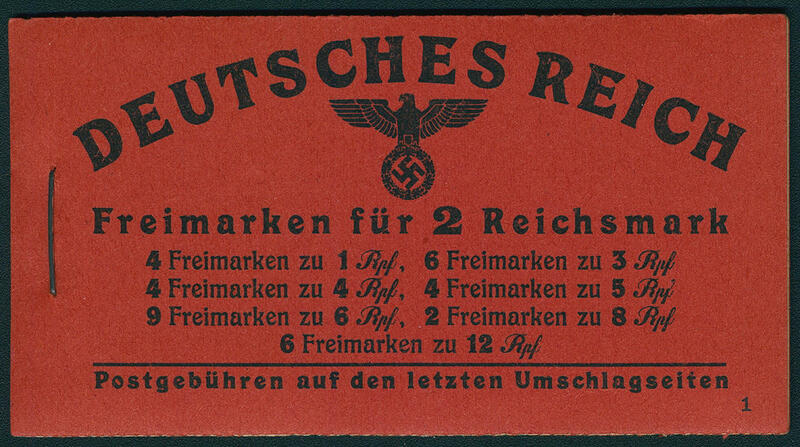 In this excellent quality extraordinarily rare! Photo expertize Dr. Simon.